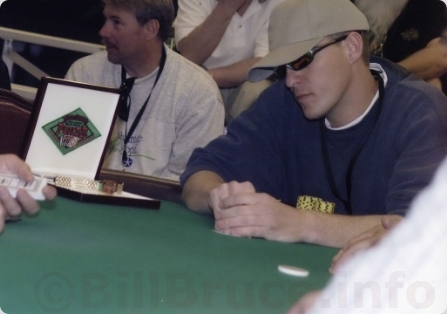 LAS VEGAS, NEVADA, April 23, 2004 - Prior to yesterday I had never played in the prestigious World Series of Poker. However, I fancy myself a poker player and supplement my income playing cash games. I decided I would try to play this year. So I woke up yesterday morning and made the 5 hour drive from my home in California to Las Vegas. I arrived just in time to get registered and take my seat for the noon starting time. I don't reccommend driving in the same day (I won't be doing it again) because these tournaments are very long and stamina is vital. I am fairly pleased with myself, all things considered, as I ended up finishing in 4th place. Below is the official Tournament Summary. Official Tournament Report by Nolan Dalla - The World Series of Poker has established a tradition of hosting a special tournament, specifically designed for casino employees. In recent years, the annual casino employees event has marked the "official" beginning of the world's biggest and most prestigious poker tournament -- as dealers, floorpersons, pit employees, bartenders, executives, and personnel from virtually all areas of the gaming business gather at the Horseshoe in downtown Las Vegas to determine who is most deserving as the casino industry's top poker player. This year, the casino employees "world championship" went to Carl "Coach" Nessel, a 57-year-old former firefighter from Thousand Oaks, CA. The Coach plays poker regularly and works assorted tournaments part-time – including this year's WSOP where he is employed as a Chip Runner. The Coach survived a grueling poker marathon, which lasted an exhausting 15 hours and 45 minutes. He won his final hand of the night with a pair of Queens against the runner up, Cory Pockat, a Poker Dealer from Colorado Springs, CO. The Coach's ride to victory did not come easy. Two-hundred seventy-nine players started the tournament promptly at 12 noon. It took 11 hours to play down to the final table, comprised of an well-rounded mix of casino employees. Five of the 9 finalists were from California. 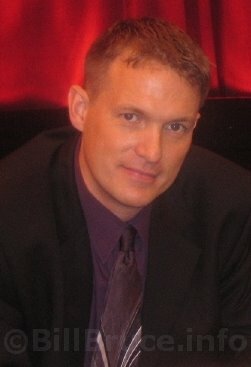 Joe Addesso, originally from San Diego – who works as a Table Games Supervisor in Las Vegas -- was the first player to exit in 9th place. He received $2,520. A short time later, William Roffe was severely short-stacked and exited in 8th place. Roffe, a Poker Dealer who was playing in only his second hold'em tournament ever, had to be proud of his performance. He collected $3,780. Stephen Calhoun, a Poker Dealer from Bradenton, FL went out next in 7th place – good for $5,040 in prize money. An hour into the final table, Roger Jenkins, a Casino Shift Manager from Union City, CA, was the shortest stack. He didn't survive and took 6th place, which amounted to a payday of $6,300. Mark Richman was bounced off the final table in 5th place, when his hand lost to Cory Pockat's straight. Richman, came in second in chips, but could not sustain the momentum he built mid-way through the tournament. Richman, who has won smaller tournaments here in Las Vegas, was awarded $7,560. Down to four players, Pockat was close to the chip lead with Bill Bruce, with about $45K each in chips. After a short break, blinds increased to $1K-2K, with betting limits at $2K-4K. Pockat took the chip lead when his A-K made top pair at the expense of Bruce. However, Bruce extracted some revenge a few hands later when he was dealt A-A and won a hand against Pockat. "I knew you had aces when I saw your cards," Pockat said jokingly. However, Bruce's glory was short-lived. He lost a key hand when the final board showed A-10-10-x-x. Bruce flashed an ace (good for top pair). But the Carl "Coach" Nessel showed down a better kicker -- with A-9. After a few more orbits, Bruce was short-stacked and made his final stand with A-Q versus Pockat's A-10. Bruce was clearly in a dominant position. But a 10 flopped for Pockat, and Bruce failed to hit his queen. The pair of 10s won the hand, and Bruce went out in 4th place. Bill Bruce, a Poker Floorperson, from Menifee, CA who was playing in one of his first ever live tournament, had $8,882 reasons to be extremely proud of his effort. With three players remaining, Pockat had the chip lead, with about $65K -- versus about $35K each for both the Coach and Leon Wheeler. One of the most important hands of the tournament occurred when the Coach topped Pockat, with A-K against A-Q. Both players caught an Ace on the turn, and put in four bets before the final card was dealt. The Coach didn't need any help, but got it anyway when a king fell on the river – good for top two pair. The key hand (and $40K pot) put the Coach back near the chip lead. After a few rounds, Wheeler was severely short on chips and made a raise with A-5, which was called by the Coach, holding Q-2. The flop came Q-8-3, giving the Coach top pair. Wheeler was committed and his last chip rolled into the pot. Two blanks fell on the turn and river, and Wheeler's ace-his was topped by the pair of queens. Leon Wheeler, a Las Vegas Poker Dealer who finished 2nd in this event last year, added a 3rd place finish to his remarkable two-year performance in this event. Based on recent history, Wheeler, who took home $11,350, seems destined to win this event at some point in the future. The two finalists merrily shook hands as heads-up play commenced, just as the clock struck 3 am. The Coach had a slight chip lead, with about $80K to Pockat's $60K. The Coach won the first five pots, and took a sledgehammer to Pockat's diminishing stack size. Within just a few minutes, Pockat's chip position had dwindled to less than $30K. But just when it the Coach might runaway with the victory, Pockat staged a nice comeback. He managed to draw back to even at one point, and it seemed that the duel might continue through the early morning. The flop came 9-7-5, giving Pockat top pair (9s). But the Coach played his hand perfectly, letting Pockat commit all his chips on what amounted to an underdog hand. The turn brought a 3 and the river brought a 10, which meant the Coach's J-J was the winning hand of the tournament. Afterward, Cory Pockat showed a mix of satisfaction and disappointment with the result. "I really thought momentum was on my side when I got back to even (in chips)," he said. "But in the end, he proved to be the better player." Pockat, making his first significant cash in a poker tournament, collected $22,000 as the runner-up. But the day clearly belonged to the retired California firefighter, who came to the WSOP to work as a Chip Runner, and play poker on the side. "I'm totally speechless," he said, as he stared at the coveted gold bracelet, awarded to each winner at the World Series. "To get to any final table, let alone the World Series, is an accomplishment that goes beyond anything else in poker," the Coach said. "I saw light at the end of the tunnel when I got (heads-up against Pockat), but the light turned out to be a train," he said complimenting his opponent. "I've been coming here since 1976. It's been a dream and a fantasy that I never thought would come true, but here I am."